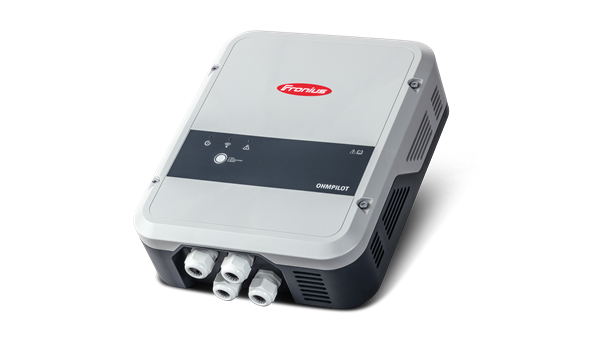 The Fronius Ohmpilot is a consumption regulator designed to use excess solar power to heat water. Thanks to the continuously adjustable regulation from 0 to 9 kW, surplus PV current can be put to highly efficient use and fed to the consumers in the household. The Fronius Ohmpilot is primarily used to intelligently control heating elements for providing hot water in boilers and buffer storage tanks, but can also be used for infrared heating or towel radiators. Solar power can thus provide a family home with average levels of water consumption with most of their hot water from April to October. The result is maximum self-consumption, a reduction in the household’s CO2 emissions and less wear on the building’s main heating system during the summer months. Related links to "Fronius Ohmpilot 9.0-3 consumption regulator"